Let’s talk about something we’d all like a little more of – money! As the owner of a business, there are a lot of decisions to make about how best to allocate the limited funds available, and it’s never an easy question to answer. When it comes to paying employees, it gets even trickier. What is “fair”? What is “reasonable”? What are managers and employees asking for? And how is it possible to spread the money you have across all these asks? The answer is almost always that it isn’t possible; what’s needed, therefore, is a way to spend the available pot as cleverly as possible. That’s where a well thought-out reward structure comes in. “But wait!”, you say, “we’re small and everyone is an important part of the team. We don’t want bureaucracy!” Not a problem; structure isn’t bureaucracy. Structure provides clarity and fairness in how decisions are made. It offers a way to help ensure questions are considered from all angles in each case. Let’s start with what structure can look like, focussing on a few key building blocks. Grading structures establish the internal relativity of jobs by defining the different levels of contribution that may be required, e.g. support, professional expertise, leadership, etc. so that it’s clear to everyone which jobs are making a similar level of contribution, regardless of their specialism. For example, what accountants contribute can be just as critical as engineers to the overall organisation. Job family structures group roles with similar skill types, e.g. engineering, accounting, sales. This is probably the structure that people understand most readily because it answers the question “What do you do?” In conjunction with grading, job family structures can illustrate how an organisation works, and how the roles and disciplines relate to each other. Pay structures rely on both grading and job family; they relate both the level and type of contribution made by a particular job to both external (“market rate”) and internal pay relativity. This is the point where a solid understanding of how the pay market works comes to the fore, and this will require some research. 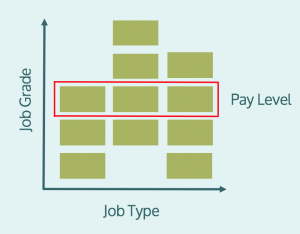 Having a pay structure in place means having some objective context for pay levels, giving leaders a framework for considering pay decisions, beyond someone asking for more. Importantly, all of these structures relate to roles, not to individuals. Of course, people will sit in the roles, and working out pay for those individuals will take into account their unique contributions. Structures based on roles simply provide a starting point in the right ballpark. Taking a role-based perspective can also be invaluable as a business grows. Understanding the number and types of roles can help with planning recruitment drives as well as identifying when the business may need a new, senior role to support growth. Reward structures are also a great tool for other kinds of people programmes; they can underpin training and development, performance management and analytics that provide insight as the business grows. They are also an invaluable tool in succession planning – a crucial activity for SMEs! The key with reward structures, though, is how they are developed and how they are applied in the business. For a growing SME, roles can be fluid, and change comes rapidly, which means any structures need to support flexibility and agility. They offer a guideline, not an answer, and can help maintain internal consistency, which will be appreciated by all employees. Transparency and fairness are big drivers of engagement, and inconsistency can be much more noticeable, and therefore a cause of disengagement or employee unrest, in a smaller business. For example, it’s not unusual in a smaller business to have a role that does “a bit of this, some of that, and also picks up this other thing”. Given a diversity of skills, it may seem impossible to find out what the “market value” of the job might be. However, by understanding the level and type of contribution (i.e. the grade) of a role, it is possible to look at the pay of other roles at a similar level and use that to position pay. Communicating how structures are developed and applied – and how they contribute to fairness – can make all the difference between managers and employees seeing them as an enabler or just bureaucracy. Involving a project group in the development, especially of grading and job family structures, can help significantly with this. It also provides other benefits as the people doing – and managing – a job are in the best place to know how it works. Having a team made up of individuals from across the business working together on a project like this can also help support the collaborative culture that is an important part of a smaller business. Introducing light-touch – but well considered and communicated – structures at an early stage in business growth will support future growth. As the organisation grows, these early frameworks will grow with it. They will be supporters and enablers of culture that everyone understands and is comfortable with, instead of something introduced when the business eventually gets too big to manage, requiring often painful culture change before they are accepted. Vanessa Landreneau, Principal of Hummingbird Consulting has built her career in Reward, working with companies in the UK and internationally, from small businesses to big corporations, charities to high tech, and boutique consultancies to Big Four professional services. She takes a pragmatic approach, defining reward structures and solutions that ensure businesses have the skills and expertise needed for growth, whilst maximising positive impact and minimising risk.